In my haze of "summit fever" I somehow forgot to mention that February is Women's Heart Health Month and this exercise in self abuse is meant to educate the public that women run the same risk of contracting heart disease as men and should take similar steps and processes to protect themselves against some of the dangers. Check out womenheart for more information and resources. 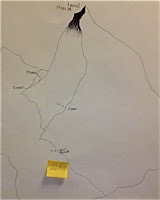 UPDATE: See the yellow post-it note in the picture for my progress on climbing Sagarmatha, Chomolungma, Qomolangma, Zhumulangma or in english plain old Mt. Everest! Arrived at work today (Mon) at 6:00 AM and spent about an hour climbing the stairs. Managed to complete 25 reps this morning and an additional 5 at my first break and 10 at lunch. Feeling a little bit sore and definitely tired, however, still managed 25 more slow reps at the end of the day. Arrived early this morning (Tues) felt great and very energized. Between 6:00-7:30 I completed 25 more reps as the likes of Korn, Godsmack, Disturbed and Ozzy assaulted my ear drums. Currently at 181 reps or an equivalent height of 15,807 (YEAH I AM OVER 1/2 WAY!) vertical feet! As a woman who was born with a heart defect and has had heart problems throughout her life, I salute you working to educate more women about heart disease. All that climbing has got to be good for your heart too! Excuse me a second while I share a story. I had someone ask me a silly question the other day that basically stated . . . "Why are you supporting women's health when your not a woman?" As I stared blankly at the individual then said "Well don't you have a daughter, wife, mother, grandmother, niece, or female cousin that you care enough about to help spread the word about women and heart disease or breast cancer, etc?" It amazes me sometimes how limited a persons view of the world can be. I bet they do. Still, it's for a good cause. As for the silly question you got asked, it always mystifies me when people can't identify with anything that doesn't directly impact them. More people need to think like you do. "More people need to think like you do." - Thanks Kristine that is very kind.